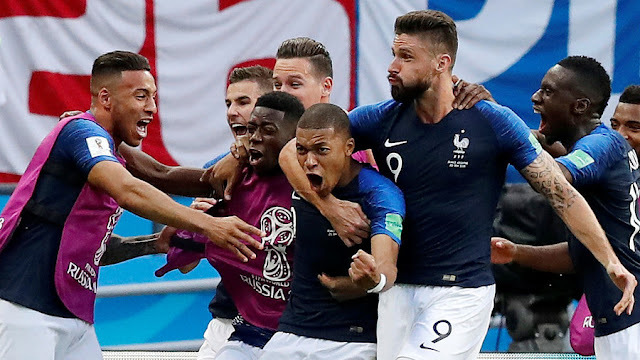 A stunning two-goal performance from teenager Kylian Mbappe fired France into the World Cup quarter-finals as they beat Argentina 4-3 in a pulsating encounter in Kazan. Mbappe’s double in the space of four second-half minutes killed off Argentina and completed a French comeback from 2-1 down. Mbappe, 19, had been instrumental in the game’s opening goal, running from mid-way in his own half and bursting past several Argentina players before being brought down in the box by Marcos Rojo. Antoine Griezmann converted the spot-kick, rolling it down the middle as Franco Armani went the wrong way in the Argentina goal. Argentina dominated possession but looked of little threat, until they found themselves level through a stunning equalizer from Angel Di Maria. Di Maria collected a pass from Ever Banega 30 yards out, rolling the ball out of his feet and firing a swerving shot into the top right-hand corner, past a despairing Lloris for the longest-range strike at Russia 2018 and one of the goals of the tournament. Argentina then took the lead early in the second half in barely-believable circumstances, when a Lionel Messi shot was deflected past Hugo Lloris by the dangling left foot of Gabriel Mercado. How much the defender meant it will be a source of debate, but Argentina cared little as they took the lead. Facing a test of their resolve, France levelled when right-back Benjamin Pavard struck a stunning volley when the ball broke to him on the edge of box, hitting the ball with spin and swerve into the top corner in a strike every bit the equal of Di Maria’s earlier effort. That set the stage for Mbappe’s knockout double, the first coming on 63 minutes when the striker made space for himself before firing under Armani. He added his second soon after, collecting from Giroud before slotting home to seal the win for France. Substitute Sergio Aguero pulled one back in the 93rd minute when he headed home a Messi cross, but it was too little too late. For Messi and Argentina it capped a disappointing campaign in Russia in which the player many consider to be the best ever failed to make his mark in what could be his last appearance on football’s biggest stage. 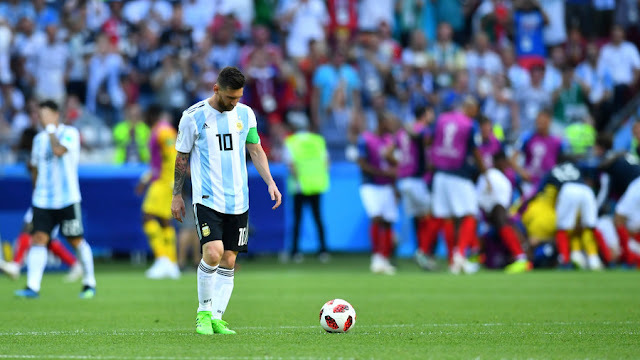 Messi’s heroics in scoring Argentina’s opening goal in the crucial win against Nigeria proved to be his most meaningful contribution to the tournament, and handed his team what merely turned out to be a temporary reprieve. In Kazan, the Barcelona star failed to exert a meaningful influence on the game as he was confined largely to the right flank, being upstaged by French teen Mbappe. For France and coach Didier Deschamps, who was taking charge of the national team for a record 80th time, the thrilling win offered a stunning riposte to critics who had derided his team’s style as stultifying and dull. France played with a verve and intent in Kazan, allowing Argentina the lion’s share of possession but looking lethal on the break. Pogba pulled the strings in midfield, with Griezmann, Giroud and Mbappe all linking up well. PSG star Mbappe in particular was sensational, bringing his prodigious talent to the world's biggest stage and showing why France will be so feared moving forwards in Russia. 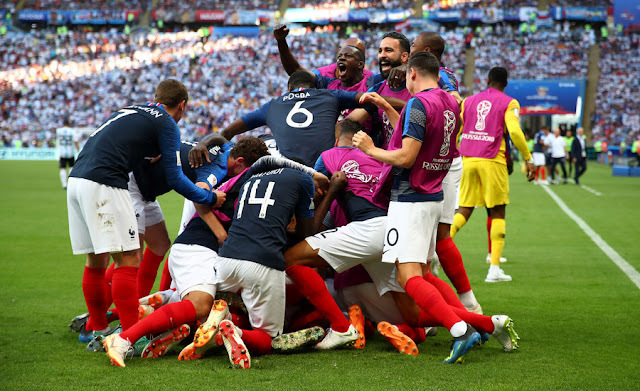 With the victory, France set up a quater-final in Nizhny Novgorod with the winners of the last 16 match between Portugal and Uruguay, who meet in Sochi later on Saturday.